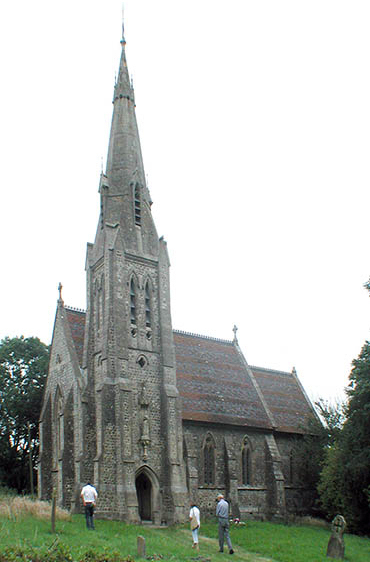 St Catherine Church, Kingsdown, is a small, exquisite church in a deeply rural location just south of the M2. From Faversham the now redundant church is approached from Doddington via Chequers Hill and Down Court Road. Designed by Edward Welby Pugin to replace a medieval church, it was built in 1866-77 at the expense of Thomas Pemberton Leigh, the first Lord Kingsdown. The only Anglican church completely designed by E. W. Pugin it remains almost exactly as he conceived it - glass, furnishings, decorations. With a needle-sharp spire and richly coloured stained glass the church is described by the Churches Conservation Trust as "a time capsule of Victorian church design".